I associate the two colors adoring this manicure with royalty. Gold and navy. Titanic and every movie, show, and commercial about New York royalty outwardly use this theme. Unfortunately, the gold I was looking for would have more yellow than silver, but this provides a different feeling, just as beautiful. Using BM plate 204 (which has a pattern I'm dying to use in addition to this one), and stamping with Color Club's Antiquated, China Glaze's First Mate took on a floral sheen. The whole nail feels brighter. From a distance, it seems more antiquated and worn. Maybe it's just the overhead light I'm typing by (thanks for that daylight savings time), but there is more of a warm glow. By the way, Antiquated is part of the Color Club Foiled collection. You can still buy it at Head2Toe Beauty. This is really great! 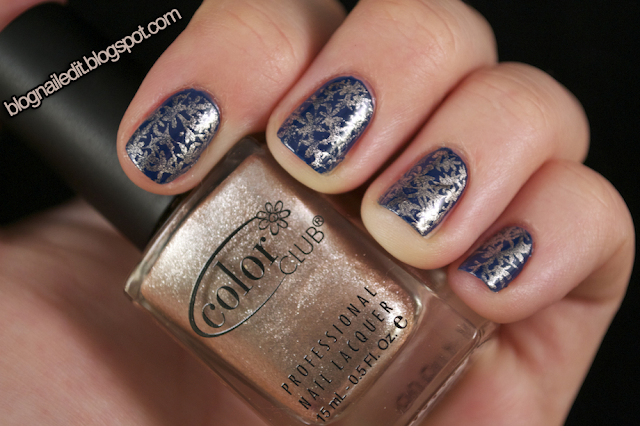 Love those foiled polishes for stamping! This is so cute! awesome stamping! Just wondering what sort of camera do you use? your pic quality is AMAZING! @JeeZ TrendZ Thank you! It's a Nikon D3100. I also use a little table top light studio to get good lighting at night. I'm not quite dedicated enough to wake up in time to catch the light, edit the pictures, and still get to work on time.